The article was inspired by a presentation by Lt. Col. Stuart Couch for the NCBA International Law & Practice Section, in which he described his difficult decision to defer prosecution of a terrorist based on his commitment to following his moral compass. The full article is available on Mica’s LinkedIn page. Mica serves as legal counsel to clients in the aviation and global supply chain industries, representing airports, general aviation companies, FBOs, and manufacturing, technology, and service companies. 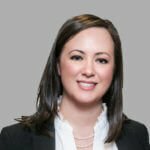 She has experience with assisting clients in defending claims involving products liability, aviation accidents, personal injury, and wrongful death claims, as well as providing analysis of issues involving aviation expert witness challenges, aircraft valuation and damages, and contract dispute resolution. As a Certified Global Business Professional (NASBITE), Mica has a specific focus on assisting global clients with their international operations including trade issues, international contracts, trade credit payment disputes, international arbitration, and dispute resolution.